My heart used to belong to the Carnival in Venice. This all changed after spending a wild day in Verona! 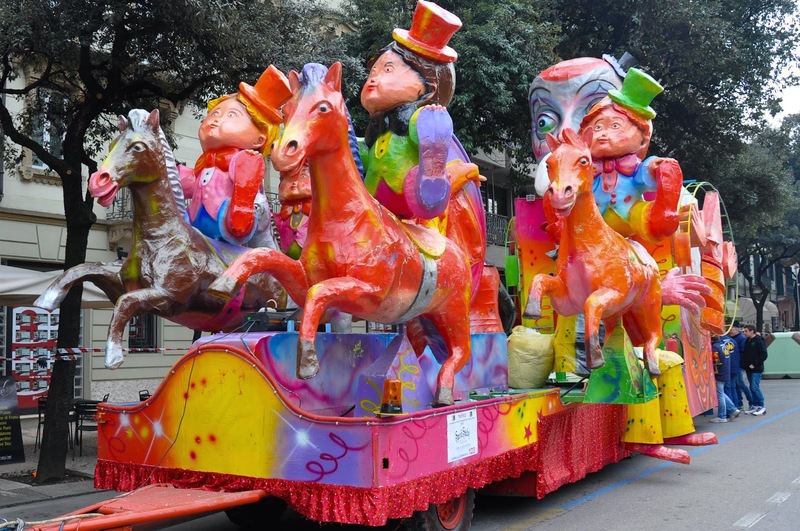 We are nearing the end of the Carnival season in Italy now and one thing that Verona has, which Venice cannot stage, is a huge parade with horses and marching bands, dancers and majorettes, historical and magical characters and, above all, fabulous floats. 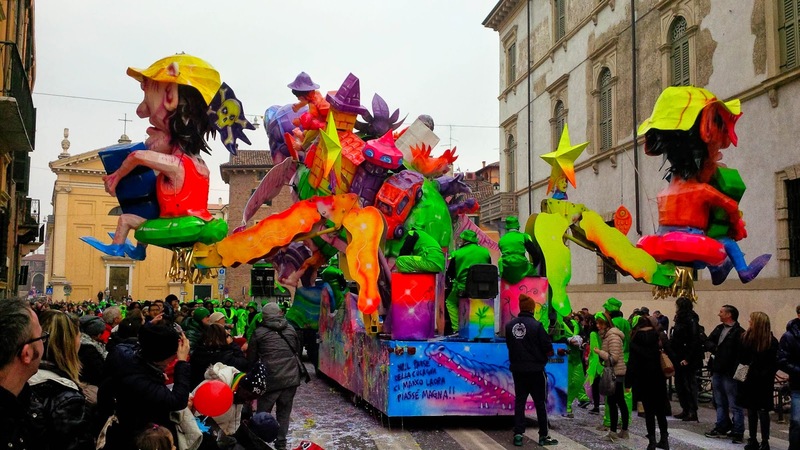 The parade takes over the historical centre of Verona with booming music and gigantic figures of papier mache and leaves it covered with piles of confetti and flour on which the feet of the thousands of happy revellers slip and slide. It all happens on Venerdi Gnocolar. 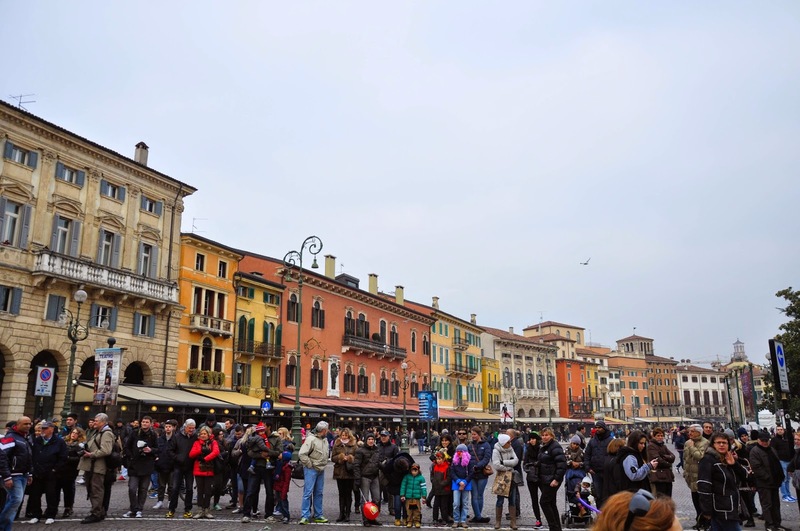 In 1531 bad crops lead to starvation among the poorest citizens of Verona. 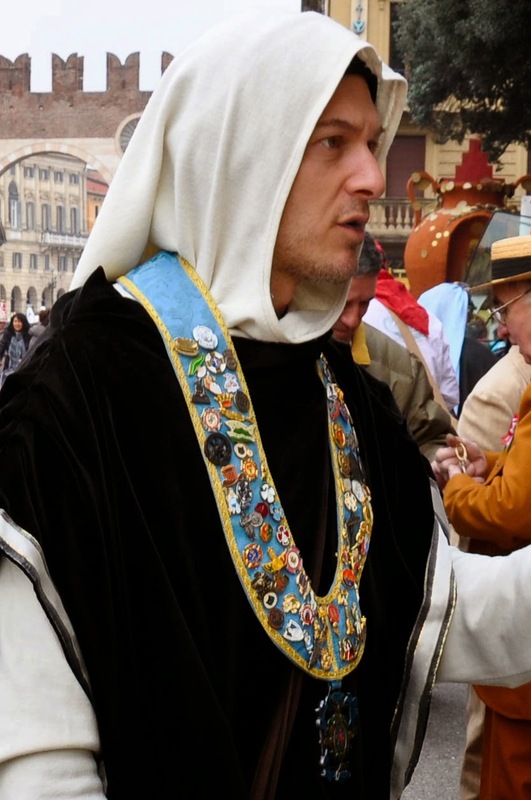 A local rich man – Tommaso Da Vico – was a member of the commission which was set to purchase and distribute grain and flour to those in need. 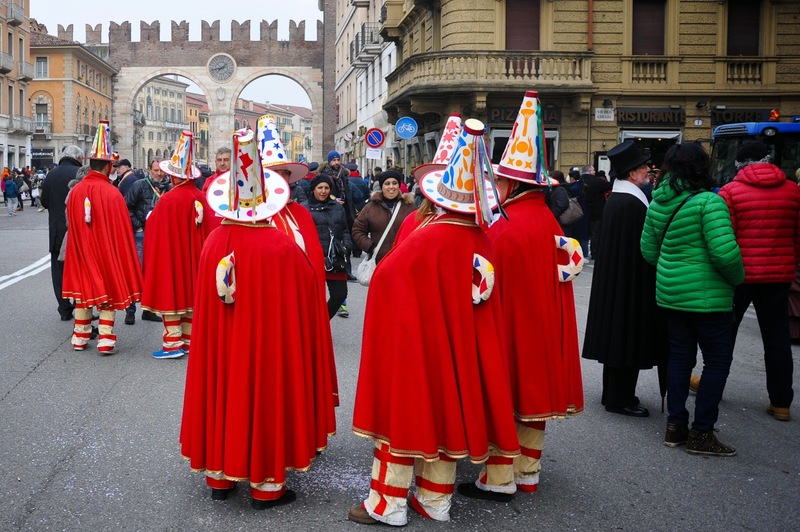 Not only that, but at his deathbed Signore Da Vico also gave orders for bread, butter, wine, flour and cheese to be distributed each year on the last Friday (in Italian venerdi) of the Carnival. Gnocolar comes from gnocci – the Italian potato dumplings. 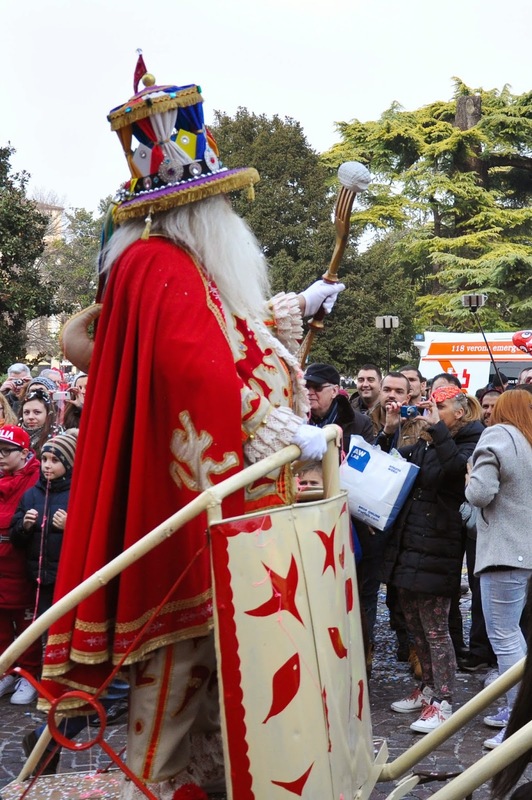 As it happens, the parade is lead by the Papa del Gnoco – a man with a long white beard who carries a big fork with a very large gnoco stuck on top of it. So, here you have it! It was Friday, the 13th. 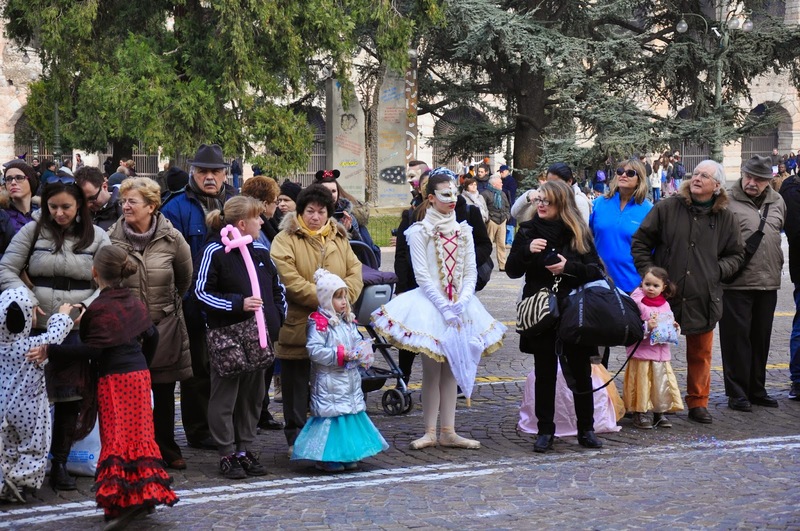 A large Carnival parade was about to happen in nearby Verona and I simply had to go. This is how a friend, my baby and I got the midday train from Vicenza and arrived at Verona Porta Nuova railway station 40 minutes later. No! This is not me! It was a lady from the fabulous parade that we were to witness. 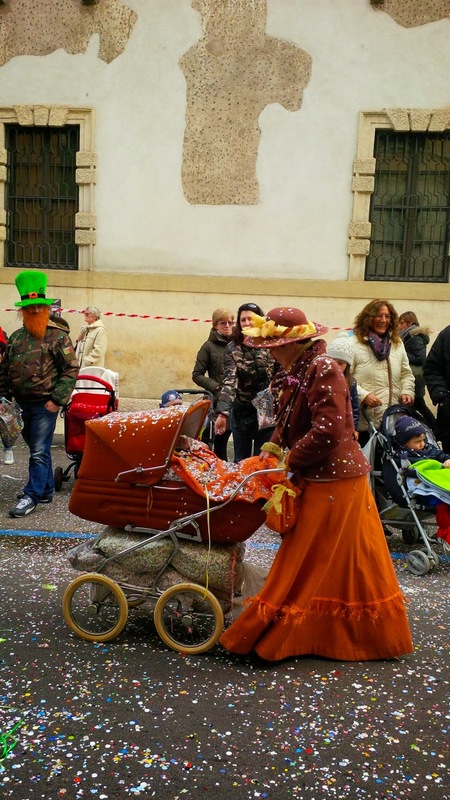 Note that the buggy was stuffed with large bags filled with confetti. 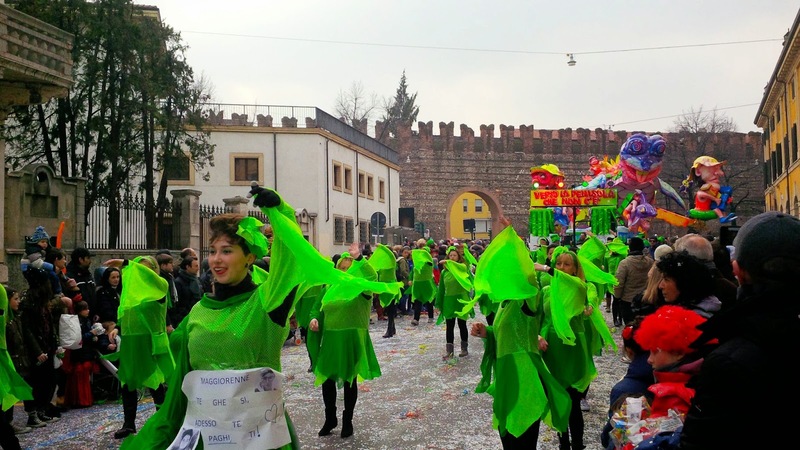 Both the audience and the participants in the parade were throwing confetti at each other with wild abandon and much rejoicing. We got totally covered in the little thingies, too. Let me start from the beginning though. 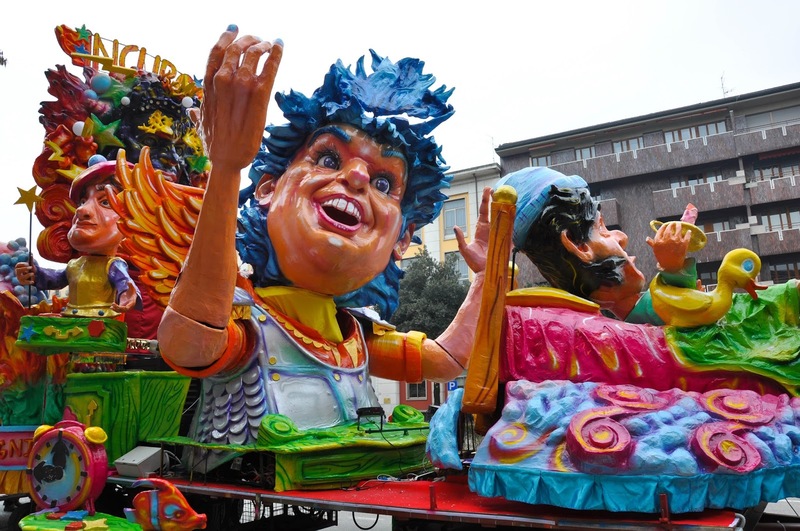 Walking into town by the almost 500 years old Porta Nuova, we saw the fabulous floats parked on one side of the road and being readied for the parade due to start in an hour or so. The air was crackling with excitement! 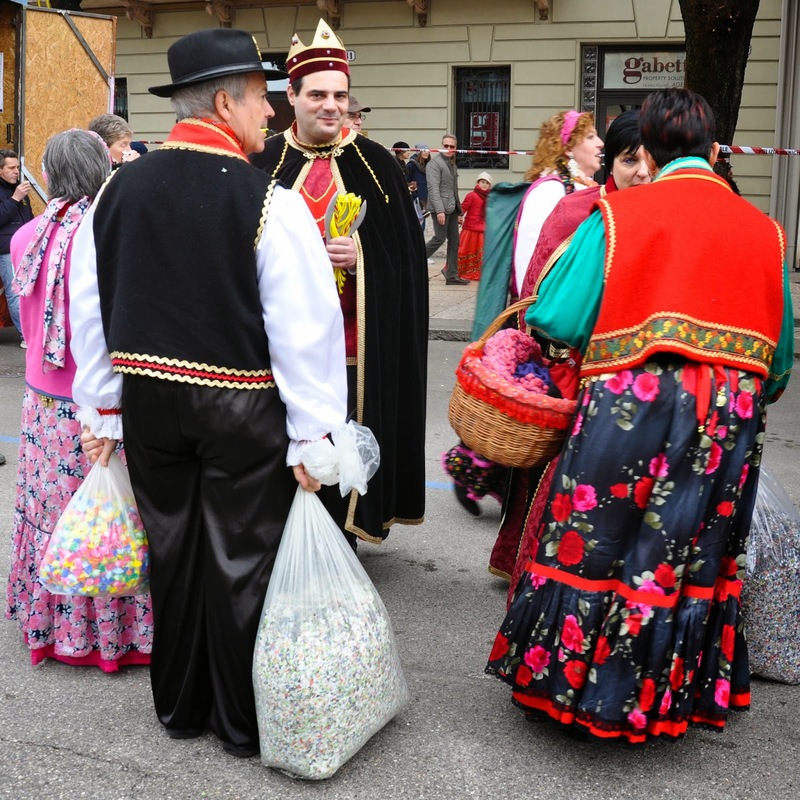 Groups of people in costumes were mingling about, carrying bags with confetti and candy. 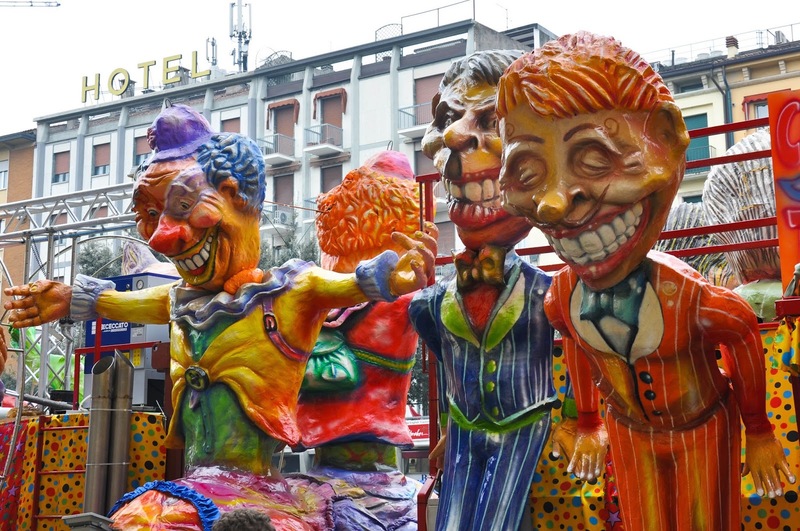 The further down the street we went, the more outrageous the floats became with large papier mache figures in bright colours populating each one of them. Strange phantasmagorical faces were staring down at us. 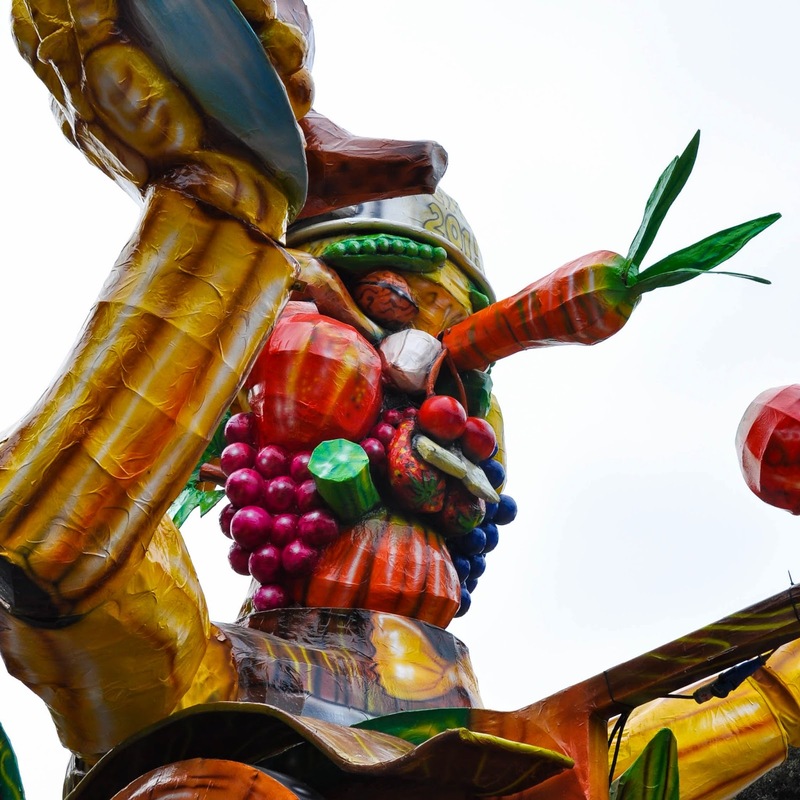 There was even a nod to Arcimboldo. 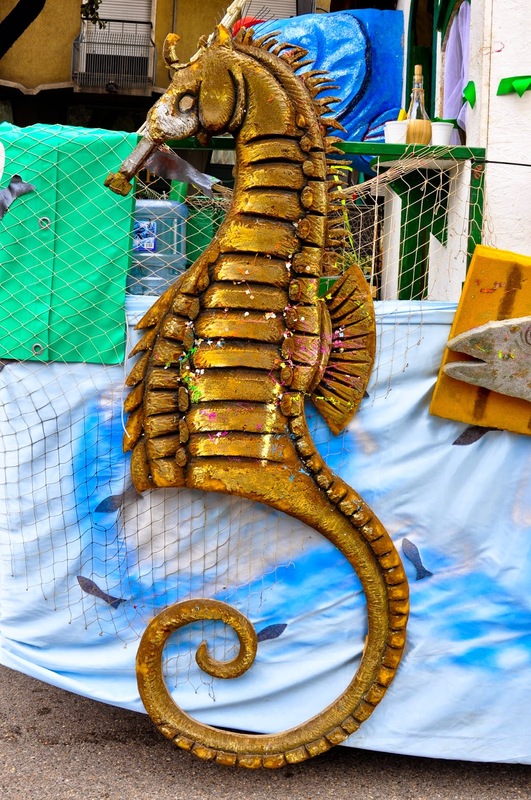 Each float had a theme – from innocuous sea-life to rather tetchier politics. It was all so bright and joyous. The atmosphere was of a street party and we couldn’t wait to join in. 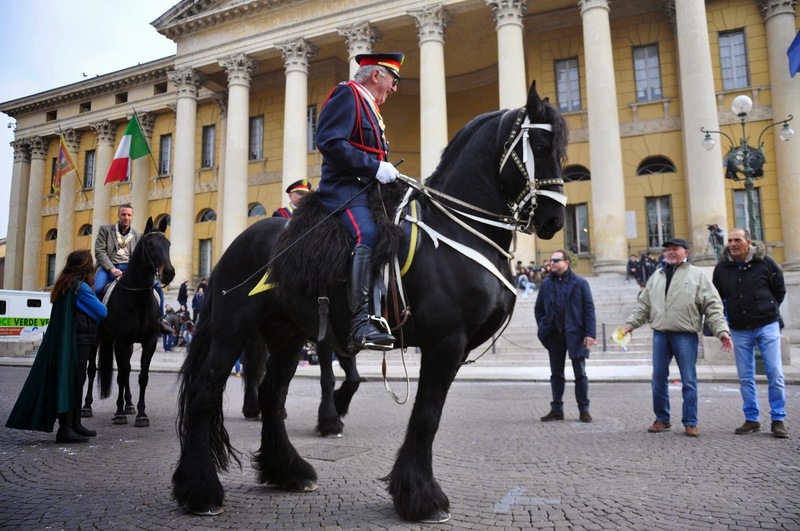 Past the arches of Porta della Citta and right at the top of Piazza Bra large crowds had started to gather waiting impatiently for the parade to begin. … and then found just the perfect spot to watch the parade. 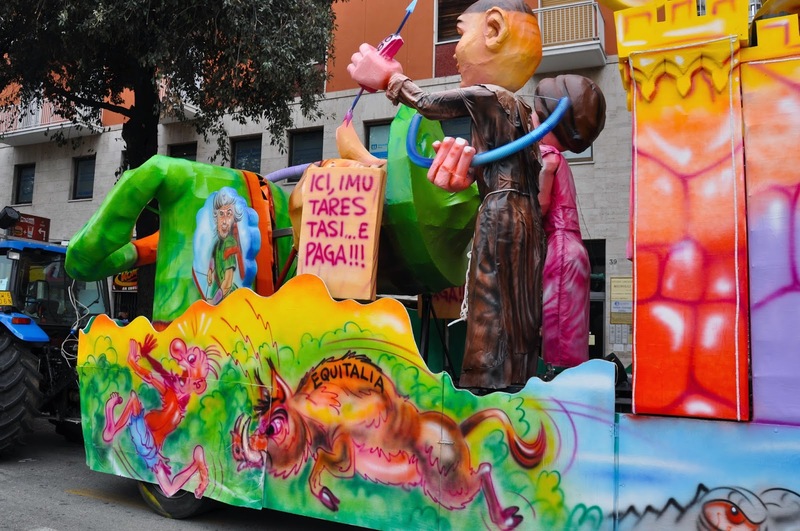 Italians really surprise me at times! With all the tightened security around Europe and the world, there was nothing there to separate spectators from the passing parade. No barriers! No visible policemen! It was fun and people were in a good mood, so we found an empty spot, positioned the buggy at the front, giving my baby a prime spot, and lined up to watch. The audience was just as interesting to observe. Kids were dressed up and there was a ballerina girl just opposite us. 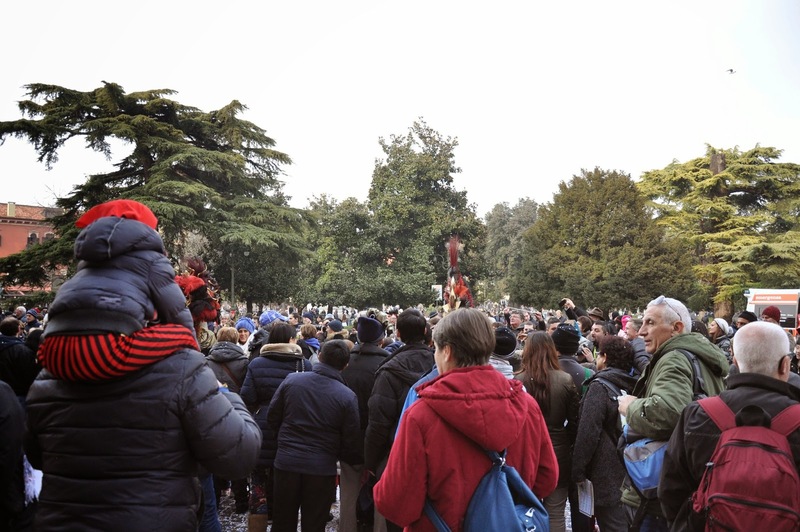 … and the parade was in full swing! Soon the real star of the event passed by us. 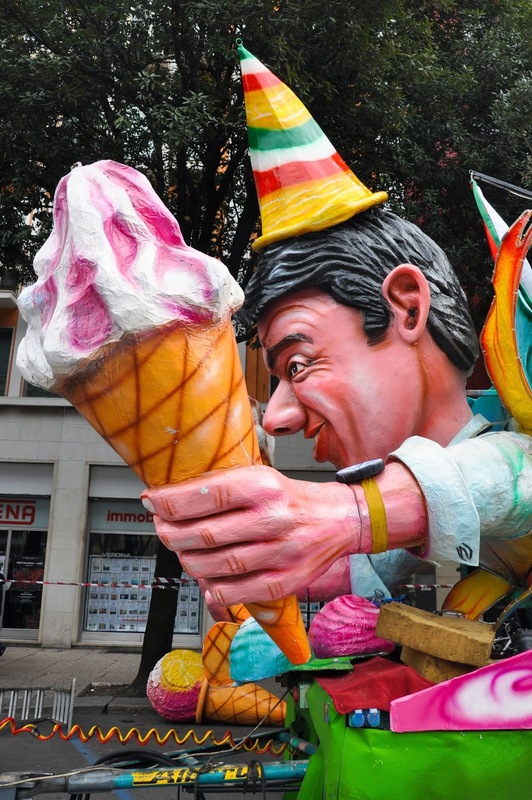 The man himself – Papa del Gnoco – waving his large fork with a giant gnoco and smiling at the crowd. Starstruck, I only managed to press the shutter when he had turned away from us. He was followed by his retinue, called the Macaroni, whom we had met earlier by the Porta della Citta. More people in fabulous costumes followed, some on foot, some riding, all flinging confetti at us and we at them and all of us having an amazing time. 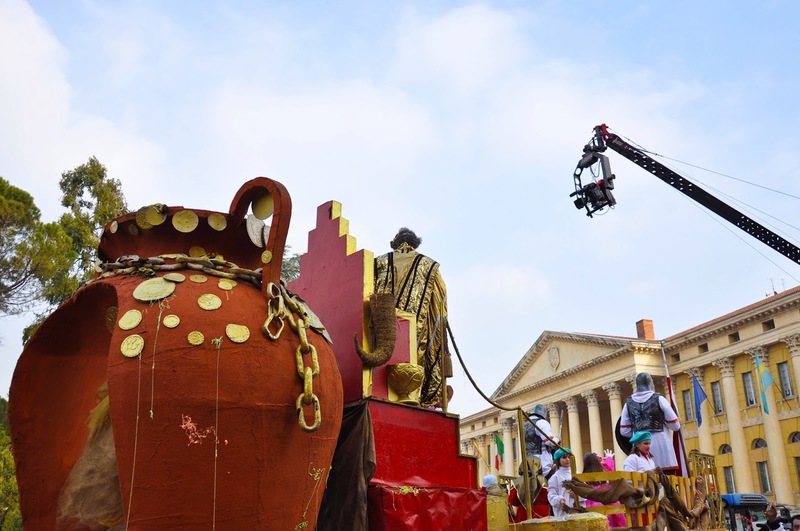 The floats started coming into view. People surged ahead eager to take just the perfect snap. 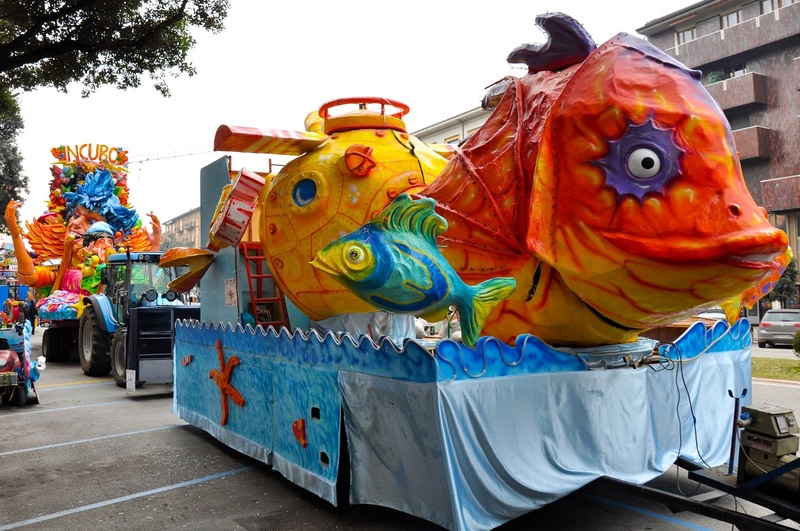 Suddenly the space for the parade to pass got narrower and narrower. There was no pushing and shoving, apart from a super eager old lady armed with a camera who tried to push my baby’s buggy out of the way, so that she can have her prime spot. The protective mother that I am, I told the lady that she was standing right in front of my daughter and to step back. I mean, she is only little, but that’s not an excuse for her not to be able to see the parade. The old lady though had an ace in her sleeve. Irrespective of all the children around her, she took a cigarette out of a pack, started smoking and soon a vicious smell engulfed us all. I mean, who does that?! I had to declare defeat. 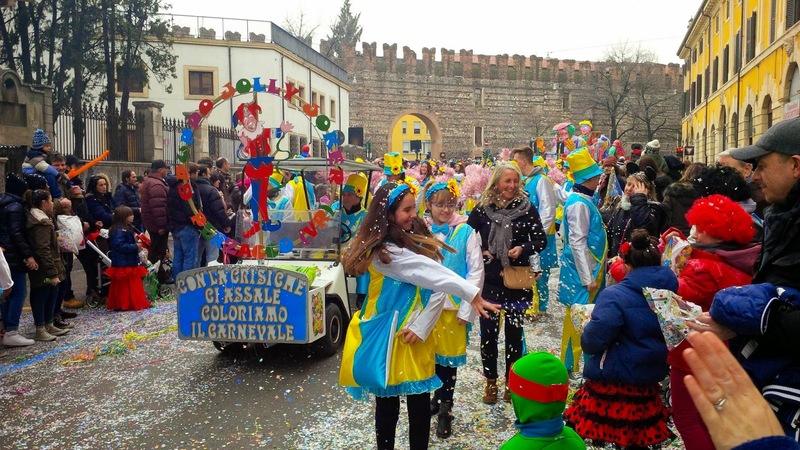 We pulled back behind the crowd, which by that point was blocking the progress of the parade, and started walking down the road, following the curve of Verona’s defensive wall. The atmosphere there was much more cheerful, with lots and lots of kids having tremendous fun. The crowd was dancing and clapping, throwing confetti by the fistful and simply enjoying life. 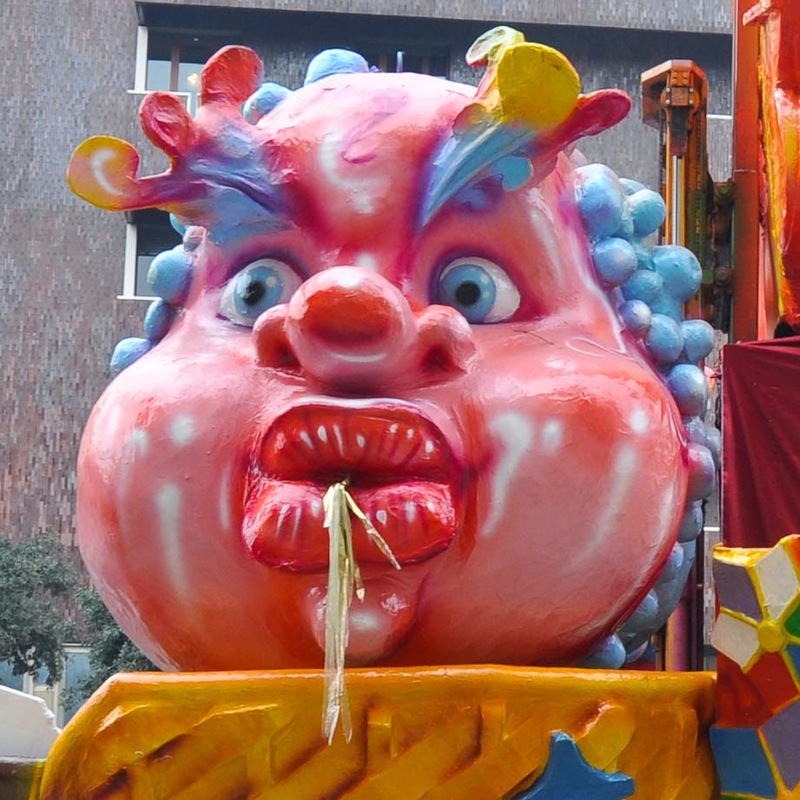 Suddenly, this huge float was above us. 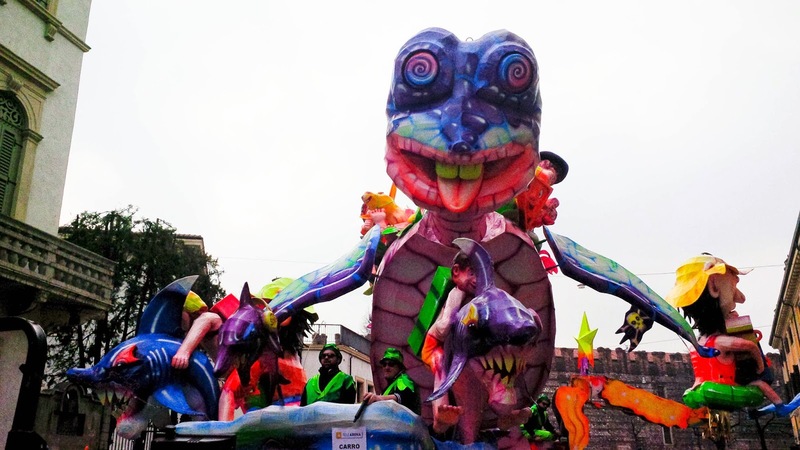 The turtle’s eyes were revolving on and on and huge papier mache figures were hanging over our heads. My baby was amazed! More and more performers passed, followed by more and more floats. Everyone was having fun. Whole families were out en masse, often wearing coordinated costumes. My favourite ones were a father with a wolf mask holding in his tight embrace his little daughter dressed as Little Red Riding Hood. There was also a man with a huge Irish leprechaun hat and bushy red beard whose tiny baby was dressed as a ladybird. Cute or what?! By that point the piles of confetti on the ground were so big, that the kids were scooping them and throwing them again. Teenagers had something much more interesting to throw at each other, mercifully avoiding the passers-by. Flour! 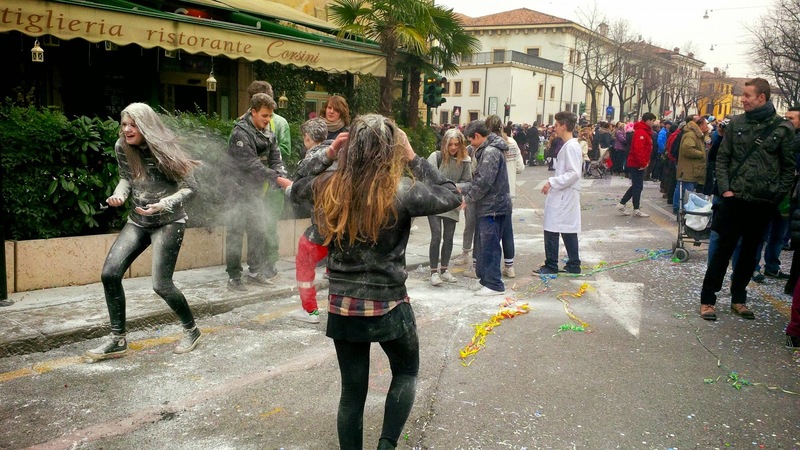 Yes, the white stuff all over their clothes and hair is flour. They were carrying whole bags of it and seemingly were having a lot of fun. 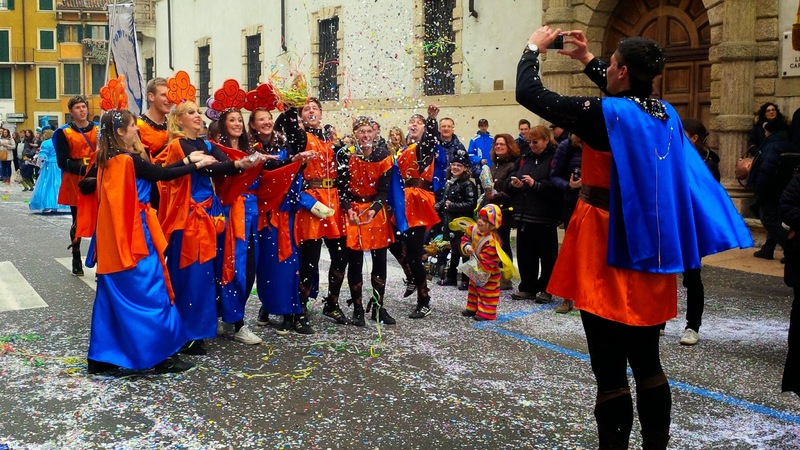 In conclusion, it was messy, it was raucous and it was fabulous being there and being part of Verona Carnival (flour throwing and eager old ladies with cameras aside)! 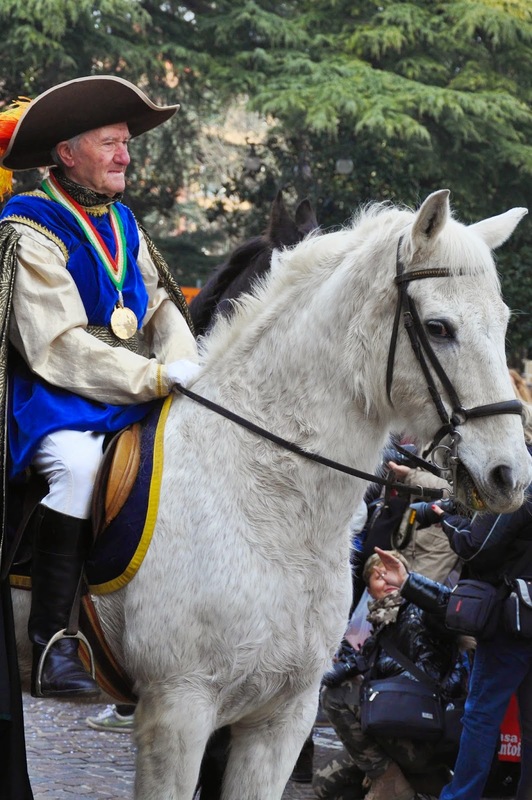 The parade was a great experience and I am already looking forward to next year’s Venerdi Gnocolar. Put it in your diaries now!